From Clemson Road: Travel west on Clemson Road until it becomes Killian Road. Take a right onto Farrow Road (Highway 555). After about half a mile, take a left on North Pines Road (just after the Sherwin-Williams store). Continue down North Pines Road until you get near the end and see a white vinyl fence. The driveway will be on your left. At the end of the driveway you will find our parking lot and church, nestled behind the trees. From I-77 South: As you are driving north out of Columbia on I-77, take the Killian Road exit (#22). Take a left on Killian Road, traveling over the interstate. Continue past Walmart and drive a couple of minutes until Killian deadends onto Wilson Blvd (Highway 21). Take a right onto Wilson Blvd, traveling north about a mile. Soon on your right you will see a little white house with a white vinyl fence starting after it; this little house is our parish office and across the grass you will see our church. Follow the fence around the corner of North Pines Road, and you will find the driveway on your right. At the end of the driveway you will find our parking lot and church, nestled behind the trees. From I-77 North: As you are driving south towards Columbia on I-77, take the Wilson Blvd exit (#24). Take a right onto Wilson Blvd (Highway 21), traveling south about two miles. You will pass a few houses with white fences, but as you approach the corner of Wilson and North Pines Road you will see our property surrounded by a white vinyl fence, and our sign on the corner. Turn left onto North Pines Road, and you will find the driveway on your right. 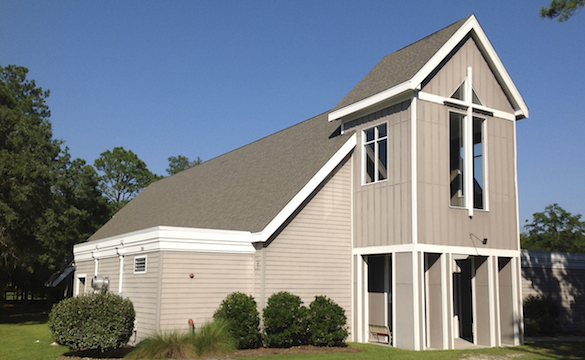 At the end of the driveway you will find our parking lot and church, nestled behind the trees. We are located northeast of Columbia, just off of I-77, at the corner of Wilson Blvd (Hwy 21) and North Pines Rd. We are only a short drive away from neighborhoods like the Summit, Lake Carolina, and Longcreek! Our church parking entrance is found at 306 North Pines Road, while our parish office is across from the church at 9720 Wilson Blvd.